I've always been passionate about dogs. The first book I bought was about taking proper care of my dog; I was just seven back then. 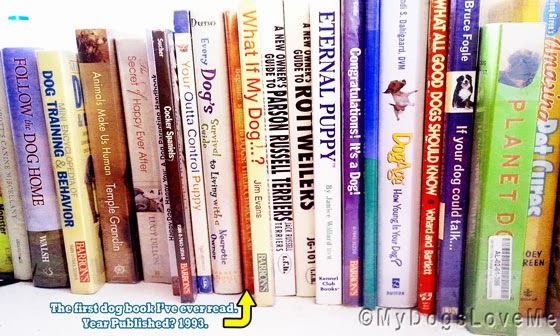 Now that I'm decades older, that book collection has increased in size since I've started My Dogs Love Me. So I may not have a library of dog books yet, but I can see my own bookshelf filled with them. These dog books are some of my favorite ones. I've collected them within the past year and a half. Most of you might have noticed that I'm a sucker for Barron's books. However, my pick of the litter remains to be "Animals Make Us Human" by Temple Grandin. Wow that is quite a little library you have there. Have a marvellous Monday. That's a lot of dog books! SHE loves to read, too, but doesn't read many dog books. I need to read that Temple Grandin book. I also love dog books! Wow- what cool books you have- yes like a little book shop! What a great topic to love... Us dogs are totally pawsome! The first book I can remember reading was, The Shaggy Dog, still reading dog books, just like you. We love a good dog book too, but we don't have near as many as you!